The first relief measures and the initial diplomatic guarantees were based upon the assumption that the emergency was a temporary one. On the 16th October 1914 the Germans guaranteed(220) imported relief supplies free from requisition and on the 20th October the British Foreign Office announced(221) that they were not stopping importations for the Belgian civilian population. The door was thus opened for emergency relief, but none of the belligerent governments appreciated the immensity of the problem or the extensive financial and diplomatic arrangements that it involved. It is interesting to recall, however, that Hoover, as his memorandum on the 20th October 1914(222) to Ambassador Page shows, perceived that the situation demanded a very considerable extension of the measures then taken. He wrote: "The organization and solution of the problem necessitates: (a) The expansion of undertakings by the military authorities not to requisition foodstuffs imported .... and further to cease the requisitions of native foods .... (b) The permit of the English authorities, conditional upon importing foodstuffs in neutral ships .... needs extension .... (d) .... It is absolutely necessary to secure positive subvention from the Allied Governments." Thus before the Commission was organized and days before the first emergency supplies were moving, Hoover in this document emphasized the three issues, viz., money, ships, and the protection from requisition of indigenous produce. The third of these issues, which is the subject of this chapter, was as vital to Belgian relief as the other two. Money, in large amounts, and ships were clearly necessary in order to purchase and deliver the great quantities of food required; but obviously the Allies would never consent to the import of food if it were to constitute a replacement of the native supplies requisitioned by the German Army. Moreover, justice in distribution would not be assured unless both the imports and the harvests were controlled by the relief organization. In theory the importations of the Commission were to furnish a supplement to local products sufficient to provide the people of the occupied regions with a ration adequate to maintain them in health. On the basis of this theory the Allies ultimately held that the whole relief enterprise was predicated on an agreement by the Germans to abstain from local requisitions and to reserve for the Belgian and French people the whole fruit of their harvests; otherwise the relief imports would be indirect but none the less valuable aid to the German armies. The British raised this issue at once when Hoover in the winter of 1914-15 began to ask for relaxation of shipping restrictions and subsidies(223) in order to put relief on the substantial basis that the situation demanded. The protection of the local harvest had an important bearing also on another phase of the Commission's work---the determination of its programs of importation, which were to cover the deficit between the amount of local food available and the minimum required to sustain the population "without immediate and serious physical deterioration. "(224) of the two factors which determined the theoretical program of importations the minimum ration requirement was constant or relatively so. It was calculated on the number of people to be fed, the calorie requirement per person per day and the calorie production of the food commodities available locally or by importation. (225) The second factor, local produce, varied from year to year. The principal causes of these variations were, in the beginning, disorganization, destruction, and confiscation during the first months of the war; and, later, lack of man power, lack of fertilizers, and, in 1917-18, the decrease in the rural area of France under enemy control because of the German retreat in the autumn of 1916 and the spring of 1917. Although the Commission imported bread grains greatly in excess of the amount locally produced, it was never able consistently to maintain the theoretical program. This was not due to want of effort but to external factors over which the Commission had no control. Foregoing chapters have shown how some of these factors---the lack of funds, the shortage of ships, the arbitrary restrictions of the British Foreign Office, the U-boats, and the world shortage of food---affected the program. Despite these difficulties, the Commission was able to approximate the ideal program closely enough to achieve the purpose of its existence---to save the population of the occupied regions from famine or serious physical deterioration from undernourishment. As has been noted in chapter vi, the occupied territories of Belgium and Northern France were divided for German administrative purposes into the Occupation and Army Zones, the one under a civil and the other a military government. This division had an important bearing on the problem of native produce. With respect to the Occupation Zone negotiations were carried on in a large measure through diplomatic channels, and the details of control were worked out in conjunction with the Comité National and German civilian officials. But in the Army Zones the situation was more delicate and complicated, for the German forces had a hand in producing the crops. Here the Commission dealt directly and exclusively with the military authorities in regard to both the protection and distribution of the local crops. Because of this administrative distinction, the documents of this chapter are divided into two groups. Part I relates to the Occupation Zone, Part II to the Army Zones. With the assurance of the Governor-General of the Occupation Zone that imported supplies would not be requisitioned, the relief committee had secured the limited acquiescence of the British Foreign Office to importations. Unquestionably no general opening of the blockade for relief purposes was conceived by the British. This situation became evident when Hoover on the 5th November(226) appealed to Sir Edward Grey for British Government recognition and financial support. Sir Edward made it clear that the continued requisition of native food by the Germans made it impossible for the British to contribute support. Hoover replied that he would endeavor to persuade the German Government to discontinue these requisitions, and he was assured that success in this would certainly influence the British Government. Hoover's first step was to inform Minister Whitlock of the British attitude and request him to approach the Governor-General. The following document is particularly interesting as it indicates the eagerness of Baron von der Goltz to see the relief work put on a permanent basis. The Comité de Secours et d'Alimentation de Bruxelles, established under the patronage of Your Excellency and of His Excellency, the Spanish Minister, has brought to my attention the question of feeding the civil population of Belgium. I am informed that the Committee has decided so to extend its scope as to provide so far as possible for feeding and clothing the civil population of the whole of Belgium. As Your Excellency knows, Belgium in ordinary time of peace produces only about one-sixth of the amount of flour necessary for its maintenance. Under existing circumstances, with practically no work being done in the country, with crops abandoned and with imports stopped, Your Excellency will realize that the question of feeding the civil population has become extremely serious. The Committee informs me that it has purchased a large consignment of foodstuffs in England and that the necessary permission having been granted by His Britannic Majesty's Government, this consignment is now being brought to Brussels by way of Holland. The military authorities here have given positive assurances in writing that these supplies shall be devoted exclusively to the feeding of the civil population. While this consignment of supplies relieves the situation, the relief is, of course, only temporary, and in the interest of all concerned an effort must be made to effect some permanent arrangement whereby foodstuffs purchased abroad may be brought into Belgium upon the distinct understanding that they shall be devoted exclusively to the use of the civil population. The Comité de Secours et d'Alimentation informs me that it is prepared to collect the necessary funds and to purchase abroad such foodstuffs, clothing, and supplies as may be necessary. The Imperial Government is prepared to offer the most formal assurances that any supplies so purchased will be scrupulously respected by the German military and civil authorities and will be exempt from seizure and requisition. The possession, control, and disposition of all these supplies will be left entirely in the hands of the Committee or its designated agents. It is hoped that in view of the acute situation in Belgium and the assurances which I have the honor to communicate to Your Excellency, His Britannic Majesty's Government will be prepared to permit the free importation into Belgium from England or other countries of such supplies as may from time to time be purchased by the Committee under Your Excellency's patronage. When informed that His Britannic Majesty's Government is prepared to agree to such an arrangement the Imperial German Government will not only order that the supplies imported for the civil population be respected, but will, further, stop all requisitions for foodstuffs in Belgium. Thus the total amount of foodstuffs which Belgium is able to produce will be left to meet the needs of the civil population. I have ventured to offer to Your Excellency the foregoing assurances on behalf of the Imperial Government, not only because of the fact that Your Excellency is charged with the protection of German interests in Belgium, but also because I feel that in view of the disinterested and neutral position of the United States no promise could have a more solemn and binding character for Germany than when offered to a representative of the United States Government. I venture, therefore, to appeal to Your Excellency to bring the foregoing considerations to the attention of His Britannic Majesty's Government and to use your good offices to assure the acceptance of an arrangement such as I have suggested. While expressing my appreciation of Your Excellency's humanitarian efforts on behalf of German subjects and others in Belgium, I avail myself of this opportunity to renew to Your Excellency the assurance of my highest consideration. The above assurances of the Governor-General were of great value but were not sufficient. Hoover decided, therefore, to attempt, through Ambassador Gerard, to secure confirmation of von der Goltz' policy from the Imperial authorities in Berlin. Such confirmation would strengthen the Commission's position in Belgium and carry greater weight than military guarantees in the pending negotiations with the British. I take this opportunity of laying before you a matter of great importance and one which threatens to involve the well-being of millions of people. As you are well aware, as one of the Honorary Chairmen of this Commission, we are making a stupendous effort to justify our countrymen, not only in efficiency and skill, but in broad dealing and humanity, in a task which has been put up to us. In order to carry this out successfully, we have necessarily to receive the support of both the German and English Governments. We fully understand the German view regarding the population of Belgium: that they, having been dependent for many years for their food supply upon imports and having considerable resources still within the country, should be able to provision themselves, were it not for the wall which has been built around them by the British Navy. On the other hand, the English view is practically that the introduction of foodstuffs into Belgium is furnishing succor to a besieged populace and that any foodstuffs that we bring them relax to that extent the strain which would otherwise fall upon the German people. Between these two clashing mill stones there is daily danger that the whole seven millions of the civil population of Belgium may be reduced, not only to starvation but, through the outbreak of violence, to at least partial massacre. In the initial stages, the attitude of the English Government was friendly and we were even allowed to purchase a certain amount of foodstuffs in England for transmission to Belgium. Our ships were assisted by the British Admiralty and generally the British Government was helpful to a great degree. This whole attitude has, however, changed during the last week and we are now confronted with an attitude on the part of this Government which threatens to overthrow the whole of our efforts. I enclose herewith an order(227) which has been sent out by the British Admiralty to all British shipowners, and as seventy per cent of the foodstuffs which we are bringing to Belgium is in British bottoms, this practically means a cessation of our supply unless we can get some relaxation. We are bringing every pressure to bear that we can devise, direct and indirect, to get this remedied, but the firm attitude of the British Government at the present moment appears to be that the large scale operations which we are carrying on defeat the military objects in the relaxation of pressure upon the Germans. It is not that the Germans take the food which we import into Belgium, as we have been able to demonstrate the most scrupulous adherence on their part to the undertakings which they have given to us, but the general feeling on the part of the British that this in the main assists the enemy. The reason for this change of front has been the recurrent requisitioning of native foodstuffs by the Germans and that, where we import one ton of foodstuffs, they make a requisition for a ton of the foodstuffs which, although it may come from the residues of supplies still in the country, simply means that by continuous requisitions on their part the Germans will secure the substitution of our foodstuffs for all of that which is now in the country. The British Government say that this indirectly amounts to our feeding the German Army. I know it is a delicate point for us to approach, but it must be vital to the Germans that we should continue this work, and if they could only view the matter from an enlightened position, I feel sure that the good feeling of the German people would cause them to order a complete cessation of local requisitions. The general indemnities which may be demanded from the Belgian people, to be collected at large from the country, is not a matter upon which we can offer any comment, but it seems to us that if their attitude toward the Belgian people were confined to a general scheme of monthly indemnities such as they threaten, instead of local communal requisitions and fines of money, it would overcome the most difficult problem with which we are faced. In other words, if the Germans take money out of Belgium it may indirectly cause great hardship, but it does not starve the Belgians because the whole problem of feeding the Belgians is the actual material foodstuff required, which we propose to introduce into the country in sufficient amounts to supplement the stores which are already there. I know that this is a delicate thing for me to suggest, and an even more delicate thing for you to take up, but the impending fate of these seven millions of people surely warrants us in any endeavor which will alleviate their position. We have now made a fairly complete canvass of the situation in Belgium and we can assure you that there is not, even in the best provided towns, more than two or three weeks' of bread supply. Numbers of localities have been exhausted for some time and the people reduced entirely to a vegetable diet. There are between one and a fourth and one and a half millions of people being supported by the Communal Kitchens, and there are another two or three millions whose only bread supply is that which we can furnish through the market. This position is getting steadily worse, until within the next sixty days absolutely the only food supply for this whole population will be that which we can import. I took the liberty a few days ago while in Rotterdam, of telegraphing(228) to you with regard to the possibility of the German Government itself making some subscription to our funds. We require about 20,000,000 marks per month in order to provision this population, and it struck me that of all the opportunities which have yet been presented for the Germans to put themselves in the best form before the American people this was the most excellent, and that if they have the vision to take up the broad attitude that the poor of Belgium are the wards of all of the Powers, and that the Germans are prepared to contribute their quota to their support, it would go a long way to break down the mass of criticism directed against them in America for their treatment of the Belgians. All of the destruction in Belgium and the levying of food supplies for the support of troops can be defended as a war measure, but to allow these people to starve while under their material control will raise a storm in the neutral world fifty times the volume of that which has already been created by any local destruction. It is my belief that the belligerent nation which refuses to participate in the succor of these people will yet have to carry the brand of Cain as their murderers. On the other hand, any kindness held out to them in this time of dire necessity will bring with itself credit which in after history will wipe out nine-tenths of the charges of ruthlessness in war. For your information I send you herewith the charts showing the material which we had in motion at the beginning of this week. Our position is considerably further improved today. One other subject before I close, and that is the question of the protection of belligerent vessels carrying our foodstuffs into Rotterdam. We are using your dispatch to encourage British owners to go to Holland but they immediately reply that there is no provision for their protection after they have discharged cargoes and started on their return voyage. I am sure the German Government in acceding to our request wishes to do it in a whole-hearted way, and will have no objection to undertaking that there shall be no interference with these ships on their return voyage from Rotterdam to British ports, so long as they fly our flag. We have no objection to the condition that there is to be no return cargo, and we will take the responsibility that our flag shall not be used except for the direct return. "Acting not officially, but as one of the Honorary Chairmen Belgian Relief Commission called today with Spanish Ambassador and Netherlands Minister on Undersecretary of State Zimmermann, who gladly and without hesitation assured us that Commanding General in Belgium will give assurances to American, Spanish, and Netherlands Ministers in Belgium that German military authorities will not make any further requisitions of food supplies in Belgium while the International Commissions are sending in food, and for a reasonable time after the last delivery." There is, however, another matter in which the Belgian Relief Commission required the assurance of the German Government. Supplies are being sent to Belgium in British ships. These ships fly the flag of the Commission, and carry nothing but these supplies for Belgium. Will the Imperial Government not give a public assurance that these boats will not only not be interfered with on the voyage to Belgium, but that there will be no interference with these ships on their return to British ports, so long as they return direct to such ports and sail under the flag of the Commission. I have received today assurances from Baron von Bissing, German Governor-General in Belgium, that orders have been given forbidding all further requisition of foodstuffs of whatever sort in Belgian territory occupied by German troops, and that the protection thus afforded covers cattle and their food as well. He will give any reiterated assurances that we may desire on any occasion that foodstuffs will not be requisitioned, and that we may establish and maintain any kind of control that we may see fit to adopt in connection with our relief work for the civil population. Similar assurances were given to my Spanish colleague. Both Zimmermann's verbal promise to Gerard and von Bissing's assurances to Whitlock came promptly into Hoover's hands. These appeared to meet British demands completely since they provided that all foodstuffs of whatever sort would be free from requisition. Hoover believed that they were exactly what he required at this stage for his negotiations with the British for governmental support. He found, however, in his interview with Sir Edward Grey on the 13th January 1915(229) that the Foreign Office now required that the Germans be persuaded to abandon certain other policies in Belgium before the British Government would commit itself in the matter of financial aid. The Germans had imposed a levy of 40,000,000 francs per month on Belgium and Sir Edward Grey declared that the British Government could not be expected to contribute funds for the support of Belgian relief so long as the Germans continued to extort money from the Belgian people. In spite of this new stipulation Hoover continued to press for wider British support, and a week later Lloyd George(230) consented to the establishment of the exchange plan as one means of financing relief. In these negotiations with the Foreign Secretary and the Chancellor of the Exchequer Hoover had supported his main argument with information from Berlin and Brussels that the protection of all native food supplies for the civilian population had been guaranteed by the Germans. Unfortunately, as the following documents show, the Imperial authorities had made an important reservation in the guarantees, which was contrary to the understanding of Messrs. Gerard and Whitlock on whose assurances Hoover had based his argument with the British. The undersigned has the honor to inform His Excellency, Mr. Gerard, Ambassador of the United States of America, with reference to the esteemed note of the 28th instant, that the Imperial Governor-General in Belgium will issue without delay an order prohibiting all the troops under his command from requisitioning food or forage of any kind whatsoever which would require to be replaced by importations by the American Committee for Belgian Relief. The Governor-General will, in addition, authorize the Minister of the United States and the Spanish Minister at Brussels as Honorary Chairmen of the Committee, to convince themselves in any way which may to them appear advisable that the prohibition is observed most scrupulously. With regard to the desire that non-neutral ships bringing food for Belgium may not be interfered with on their return to British ports, and that assurance to this effect might be given, reference is respectfully made to the Note Verbale of the 24th instant, No. 3 of which contains provisions dealing with this desire. The undersigned avails himself of the opportunity to renew to the Ambassador the assurances of his most distinguished consideration. With my approval the guarantee has been given to the Comité National de Secours et d'Alimentation, through the intermediary of the Foreign Office that all troops under my orders are forbidden to requisition foodstuffs or artificially prepared fodder materials of any kind whatsoever, replacement of which must be effectuated through importation by the Comité. In issuing this prohibition in supplement to the decree of November 24th, 1914, (IV a. 11 b. No. 727/II. 11), I remark that it has been a question hitherto, in the supplies imported by the Comité, of flour and breadstuffs, rice, peas, beans, salt, maize, and sugar, but that, in the near future, there will also presumably be imported foddercakes and other artificially prepared fodder materials. Supplies of this sort therefore may no longer be requisitioned under any conditions by the troops placed under my command, consequently not even against payment. The exception made in article 6 of my decree of December 29th, 1914 (IV.a.1628/12 I. ), in regard to the goods in bulk detained in Antwerp pp [praemissis praemittendis] is valid in the present case also. In reply to Your Excellency's very obliging communication of the 5th instant, I have the honor to say that the ordinance of the Governor-General of the 21st ultimo, concerning a further restriction in the matter of requisitions applies only to the Occupation Zone and not to the Étape. I have the honor to remain, etc. Referring to your letter of the 9th instant, I am quite willing, in order to encourage the humanitarian efforts of the Comité which have always had my warmest sympathies, to confirm herewith the previous declarations which have already been given to the Comité in October 1914 and January of this year. According to these, the foodstuffs of all kinds imported by the Comité for the feeding of the civil population of Belgium remain exclusively reserved for the population of Belgium, and must remain free from military requisitions. I also repeat, in conformity with my declaration of January, that all troops under my orders in the Occupation Zone are forbidden to take, even against payment, foodstuffs and artificial foods for animals, of any kind whatsoever, which are replaced through importations by the Comité. I attach herewith copy of my instructions of January 21, 1915, to my troops. I cannot agree with your opinion that "every product obtained from our soil" is already being imported by you, and could therefore no longer be requisitioned. In particular, it is not within my knowledge that oats, straw, hay, potatoes, fresh vegetables, and sugar are imported in such quantities that my prohibition should be extended to these articles also. If English financial circles demand a more extended declaration in the sense that the Imperial General Government exempt from requisition all foods without any distinction, necessary for the maintenance of the people and animals, which shall be produced hereafter in the country, I regret that I am not in a position to give such a declaration. On the contrary, adherence must be continued to the principle that the stocks of articles specified in detail, which were still in the country at the time of the publication of my declaration of January 21, 1915, shall be kept for the country and may not be requisitioned in favor of the troops, even against payment. Hoover returned to London with a clear and definite confirmation from the highest German authorities of the various guarantees already given, but without the new guarantees he particularly desired. He found the British Government extremely interested in the report of his mission to Berlin and inclined to accommodation. The Foreign Office(236) kept its record clear by refusing "direct" assistance, but Lloyd George advised(237) Hoover that finance would be supplied through the Belgian Government "to the new harvest." This timely but by no means permanent solution of the financial difficulties of the Commission had come rather more quickly than even Hoover had dared to anticipate. It was evident, however, that since his first conversation with Lloyd George on the 21st January(238) the Chancellor of the Exchequer had become a staunch supporter of the Commission. He was alert to the humanitarian aspect of the relief operations and more than some of the members of the Government he appreciated the force of world opinion which had been mobilized behind the Commission's activities. The first drive for relief contributions in America was in full swing and a powerful public interest in the fate of Belgium was aroused. There might be doubt as to whether American opinion was pro-Ally or pro-German but there was no doubt that it was overwhelmingly pro-Belgian. As soon as Hoover was assured of this temporary respite---a subsidy until June---he began to press the Germans to give such guarantees respecting the new harvest of 1915 as would insure justice to the Belgians and meet the reasonable British demands. The documents which follow show Hoover's efforts in this direction. They also indicate that the British were determined to make no further concessions. The real important situation, which I set out in my separate letter, revolves round our desire to protect this year's harvest in Belgium, for if the present military situation is going to continue there is nothing in God's world which will save the Belgians from extinction except their own products, and if these are going to be taken away from them we may just as well throw up our hands today as next August. We would like you to consider whether or not it would not be wise if you would have a personal discussion with the Emperor on this major question and possibly the minor ones. I feel that for us to go back to the civil authorities in Berlin only places us in further difficulties in Brussels, as von Bissing only resents any such negotiations on our part, and the civil authorities in Berlin have no authority over him at all. If you do not think it is possible to do anything by way of a personal interview and that it could be framed up by the Emperor in such a manner as not to put us in the wrong, I doubt the wisdom of opening it up in any formal way through the Foreign Office. It comes to this: that interference on our behalf by the civil government in Berlin only makes our state worse in Belgium and we would rather fight along directly with von Bissing than have the interference of the German Foreign Office. If, on the other hand, the Emperor himself would interest himself in seeing that our humanitarian efforts are carried out on the lines of the separate letter which I enclose, our path would then be comparatively easy, for not only can I provide the finance until next August but the crop in Belgium would carry these people on another four months after that date. I have written this separate letter in such a form that it might be possible that you could use it directly with the Emperor. You will recollect the conversation which we had in Berlin with various members of the government, which finally settled down to a proposal from the German Government that they would facilitate the creation of Belgian provincial obligations which we group together and upon which we could float a loan for Belgian relief, and I was informed in Berlin that the German Government would have no objection to its being guaranteed by the Belgian Government at Havre, the object of this Belgian Government guarantee being to give assurances to the lenders that the loan would be recognized by the Belgian Government if it came into power. We were referred to Brussels to settle the details. I went to Brussels and was there informed by a member of the German Finance Ministry that before this project could be further consummated it would be necessary to have a firm agreement with the English Government that the shipping of the foodstuffs into Belgium would not be interfered with through the whole period of the war. I therefore returned to England and busied myself at once about securing this assurance. The English Foreign Office finally replied that they would have no objection to giving the assurance but that it would be conditional upon an agreement from the German Government to you that (a) there should be likewise no requisitions or purchases by the Germans of native or imported foodstuffs, cattle, or cattle fodder of any kind in Belgium throughout the war, and (b) that the Commission for Relief in Belgium should maintain an adequate staff in Belgium properly to account for the responsibility of the distribution of the imported foodstuffs to the civilian population and the consummation of the guarantees as above. I communicated this fact to our colleagues in Brussels, and Mr. Francqui as Chairman of the Comité National took up negotiations with the representatives of the German Finance Department and stated that it would be necessary to have these undertakings. The local representatives in Brussels stated that this matter would have to be referred to Berlin, and nothing was accomplished. Later on Mr. Francqui addressed a letter to General von Bissing, asking that such undertakings should be given, because it was hopeless for us to secure finance unless such guarantees were given as would protect this year's harvests. His Excellency replied refusing to extend these undertakings already given, and in effect pointing out that these undertakings only applied to foodstuffs remaining in the country as at January 21st; that is, they make no undertaking as to anything introduced after that date. We are therefore brought to an absolute deadlock. The English Government refuses absolutely to give any such undertaking as the Germans wish with regard to shipping unless the Germans give assurances on their side as to leaving the Belgians the use of their meager food supply and their future production, and, moreover, as stated above, it is utterly useless for us to endeavor to raise a loan from financial houses without both assurances. No one is going to lend us money with which to buy food when the probability stares us in the face that the German Army will take possession of the harvest or that the English will suppress our operations. We are now getting into desperate financial straits and the Commission at the present moment is 32,000,000 marks in debt on the Belgian account. This arises from the fact that in the hope that we would solve the above difficulties we have made purchases which are vitally necessary in order to maintain the regular flow of foodstuff into Belgium. Our situation was so desperate that I asked Mr. Francqui to come over and see if we could not devise some measure to raise money. We have succeeded to the extent of enough money to cover our obligations to the end of April by advances which we are securing partly as a matter of exchange on Belgium and partly as advances on guarantees by Belgian banks. These operations, however, exhaust present resources. We have, however, to purchase over 40,000,000 marks of food per month on Belgian account and our philanthropic support has now dwindled to about 8,000,000 marks a month, so that unless we can obtain the assurances that we have asked for we shall come to a hopeless debacle about the 1st of May as we shall then be unable to meet our progressive liabilities from resources now in hand. Inasmuch as it appears to me that the things we have asked for are so moderate, I cannot believe that the secondary German officials refuse owing to the lack of broad understanding as to the importance of this work from the German point of view, to say nothing of its humanitarian aspect. Many thanks for your letter of the 29th ultimo, regarding your agreement(239) with the German General Staff about the conditions of your work in Northern France. As I told you the other day, the conditions of your work in these districts are not our business, but are matters for the French Government. But it may be worth while for me to point out, in connection with our recent correspondence, that this Government would regard these conditions as wholly unsatisfactory if applied in any way to Belgium. Points 4 and 5 are of course the offending provisions. The Germans here admit that they have done in France what in effect they have recently taken steps to do in Belgium by enforcing the registration of all stocks of foodstuffs in the country---namely to take all such stocks under their own control and then plead that they are their own stocks and not the stocks of the civil population. You remember the history of the military stores at Antwerp and you are doubtless aware of the other enormous seizures at Antwerp from private stores like those of the Liebig factory. You remember too the parade of generosity with which the Germans placed half their "military" stores at Brussels at your disposal in December, provided you replaced them eventually. The fixed policy of the Germans is clearly to make larceny a title of ownership and we rely upon you to resist all such attempts at encroachment in Belgium by every means in your power. But though point 4 is bad, point 5 is infinitely worse. We really must insist that in Belgium the Germans shall scrupulously respect the produce of the next harvest. Any attempt on the part of the Germans to go back on or to restrict the application of their undertaking to requisition no more foodstuffs in Belgium; any attempt to get hold of the next harvest by indirect means; will lead us immediately to reconsider our whole attitude. We must be satisfied that the certainty of the continuance of your supplies does not enable the Germans to divert to their own use one ounce of the food which would otherwise be at the disposal of the civil population. We must be satisfied of this, not only by guarantees given by the Germans, but by adequate supervision maintained by your agents and facilitated by the German authorities. We have compromised on many points hitherto, but we can assent to no compromise on this point. And the German conditions as to the French districts are therefore gravely disquieting, because they indicate an intention generously to allow you to exist provided that they are thereby enabled to take every scrap of food which the country has produced in the past or may produce in the future. This is intolerable and, in the interests of the continuance of the various arrangements under which you work, I sincerely hope that you will be able to induce the Germans to abandon this impossible position. Many thanks for your letter of the 19th. The new treaty(240) with the Germans in France is certainly an improvement on the first one, but point 8 contains the objectionable features against which I protested in the first. As to the harvest, I know that Mr. Gerard is going to the Emperor personally about it, so I will say no more than that a settlement on this point is absolutely necessary if our present arrangements are to continue. As to the continuance of requisitions against "bons," the provision is, to say the least, strange. In the first treaty the Germans said that there were no more foodstuffs in the possession of the population, as they had all been converted into military stores. The two statements do not tally, but both are absolutely inadmissible from our point of view. The above is my own opinion only, but I feel most strongly about it, and I don't think anyone here is likely to feel less strongly than I! I have, however, just received an intimation from the Allied Governments of another phase of this matter which is of dominating importance. They now say that if the Germans will make no undertaking to leave to the Belgians their harvest, the Allied Governments will have to insist that the efforts and organization of this Committee come to an end on the 15th day of August and that it should then absolutely dissolve. This would be a great pity, because if the present situation should continue into next year and even if the Belgians did retain their harvest and their local production, their breadstuffs would not be likely to last beyond the end of October in any event. You can yourself imagine what would be the attitude of the military party in this country, with whom we have had such infinite difficulties, if next autumn we should propose to re-enter Belgium and in the meantime the Germans had requisitioned or absorbed any of the native food supplies. The contention of this element in the Allied Governments, that the efforts of this Commission were merely replenishing requisitioned material, would be self-evident and I am certain we could never again obtain approval to restart. When I addressed you last it was with the hope that some undertaking with regard to the harvest could be entered upon, in order to facilitate the financial gap in our budget between now and harvest. We have had to fight our own way through this difficulty and are likely to succeed. But if the Germans would like to keep this Commission alive as against the eventuality that they still occupy the same territory after the end of next October, it is positively essential that they should make, at once, a broad and sufficient undertaking with regard to the whole of the foodstuffs produced within the Occupation Zone. If we are to go on after harvest we have also got to make some sort of definite financial arrangements for our support. If the German Government would comply with our request for a definite and broad undertaking with regard to the protection of the native food supplies during the whole of their occupation, I am satisfied that we could create some kind of a financial institution and float a loan on the back of the Belgian provinces. We should not, in this event, require any direct assistance from the German Government, but I can only reiterate that the whole future of the business now depends upon whether the German Government will enter into such undertakings with regard to native production. You will be glad to know that we have got this business on to a satisfactory working basis and have already distributed over 20,000 tons of flour to these people. The German authorities are co-operating in the most cordial and efficient manner and the work is going very smoothly. You will please find enclosed herewith, copy of a purported interview with General von Bissing, which appeared in the New York Staatszeitung on the 12th April. I have telegraphed most of this interview to Brussels and asked them to confirm from General von Bissing whether or no he made such statements. I cannot believe that he did. The inference from the statements is that we are a lot of commercial pirates operating under the cloak of charity and our staff at this end and in New York are so indignant that they threaten to resign unless the matter can be put right before the American people and I am afraid that some of them will break loose and express their opinions of General von Bissing in a manner which will not enhance the opinion of the neutral world as to his administration. I am, however, trying to hold them in leash. Every German official in Belgium must know perfectly well that there are now 1,500,000 people being fed gratis from the public canteens and that these canteens are being supported by this Commission. Also General von Bissing is perfectly well aware that whereas we do sell foodstuffs to those who can still pay, at a small margin of profit, this margin of profit goes to assist in the support of the canteens and to make up some part of the deficiency which must be otherwise supplied entirely by public charity. By the middle of August we shall have expended a total of over M. 250,000,000 on foodstuffs for the Belgians and of this between M. 60,000,000 and M. 70,000,000 will have been spent on the destitute, which sums have been secured by way of donations amounting to approximately M. 50,000,000, and we have earned a balance of M. 10,000,000 or M. 20,000,000 out of profits made from the sale of foodstuffs to those who can pay. Furthermore we shall have achieved a point of merit in that although a small profit is earned on the foodstuffs sold, we have maintained the price of bread in Belgium at from 10 per cent to 15 per cent below the price in London. This could only have been accomplished by the efficient volunteer and self-denying efforts of the many hundreds of Americans who have been engaged upon this task. If we are to maintain this machinery in existence after August it is going to be necessary not only to have the question of requisition settled but that General von Bissing shall remove the stigma which he has placed over this body of idealists. I, however, sometimes feel constrained to believe that there is nothing that an American can do which in German eyes is not founded on sinister motives no matter how much the Germans themselves may benefit from it. You will remember that on April 6th I wrote to you a letter,(241) the latter part of which dealt with the question of the treatment by the Germans of the coming harvest in the districts in German occupation where you are carrying on your provisioning work. I there explained to you that we could assent to no compromise on this point; that we "must insist that in Belgium the Germans shall scrupulously respect the produce of the next harvest." Some time has passed and I have heard nothing further from you. Meanwhile we have been allowing you to send seed into Belgium, in the belief that the harvest when it comes will be used exclusively for the civil population whom you have so narrowly saved from starvation during all these months. We cannot wait much longer for a satisfactory declaration of the attitude of the German authorities, nor can I run any risk of your being able to say in the future that I did not give you sufficient warning of what may happen. It is self-evident to me, and must be equally so to you, that your work will in all probability have to stop when the harvest matures, that is to say, I presume, about the middle of August, unless positive guarantees are forthcoming from the German authorities that they will scrupulously respect, and abstain from requisitioning, the harvest in all the areas where your work is going on. I even foresee that, unless such guarantees are given soon, a strong opinion will develop in this country that your work should not continue up to the moment of the new harvest, thus tiding the Germans over the whole period until they obtain new material for requisitions. The Germans have given nothing to the people of these areas during the past months; they must take nothing from them during the months to come. In view of these probable grave results of the present uncertainty, I sincerely trust that you will be able to inform me very soon, and at any rate before the end of the present month, that you have obtained the necessary guarantees from the German authorities. At the instance of Mr. Hoover, Chairman of the Commission for Relief in Belgium, I have the honor to bring herewith to Your Excellency's kind consideration certain aspects of the work of the Commission as regards the disposition of this year's harvest in Belgium. As Your Excellency is perhaps aware, the Commission was unable to complete definite financial arrangements in England for financing the Commission without obtaining from the Imperial Government a broad undertaking that no more native foodstuffs would be requisitioned in Belgium by the German authorities until peace was concluded, such an undertaking referring only to the Occupation Zone, not to the Operation Zone. Up to the present time the Commission has been able to revolve their resources by virtue of a considerable amount of commercial exchange in Belgium, which it has secured by advertising in the United States that it would make payments in Belgium as against moneys paid to it in that country and it has therefore gathered up a good many balances owing to Belgian firms and individuals in the United States as a result of pre-war trading operations. Furthermore, it has had some money from the Belgian Government for distribution among the communes in Belgium, in accordance with the arrangements made, with the approval of the German authorities, in Brussels on December 1st last. The Commission is not certain whether or not it can maintain its finances in order until the next harvest, but hopes for the best. The Commission has, however, just received an intimation from the Allied Governments of another phase of the matter of serious importance. The Commission is informed by them that, if the Imperial Government will not make an undertaking to leave to the Belgians their harvest, the Allied Governments will have to insist that the efforts and organization of this Commission come to an end on the 15th day of August and that it should then absolutely dissolve. The Commission considers this a great pity, because if the present situation should continue into next year, and even if the Belgians did retain their harvest and their local production, the breadstuffs would not be likely to last beyond the end of October in any event. The Commission is of the opinion that, should the Commission, having thus been compelled to suspend its work because of the absence of such an undertaking on the part of Germany, propose to re-enter Belgium next autumn, and the German authorities had requisitioned or absorbed any of the native food supplies, it would never be possible for the Commission to obtain permission from the British authorities to resume its activities on the ground that the Commission would be merely replenishing requisitioned supplies. It therefore results, in the opinion of the Commission, that, if the Imperial Government desires to keep the Commission alive as against the eventuality that the German forces still occupy the same territory after the end of next October, it is positively essential that it should make, at once, a broad and adequate undertaking with regard to the whole of the foodstuffs produced within the Occupation Zone. Furthermore, if the Commission is to go on after the harvest, it feels that it must make some sort of financial arrangements for its support. The Commission is of the opinion that, if the Imperial Government would comply with the request for a definite and broad undertaking with regard to the protection of the native food supplies during the whole of the occupation of Belgian territory by German forces, the Commission is confident that it could create some kind of a financial institution and float a loan on the back of the Belgian provinces. In this event, the Commission would not require any direct assistance from the Imperial Government. Mr. Hoover concludes by reiterating that the whole future of the undertaking now depends upon whether the Imperial Government will enter into such undertakings with regard to the native production. The Minister of the United States has kindly handed me a copy of the letter you sent him on the 20th April last, which reached Brussels after a long delay due to-the interruption of the mail service. Future Policy.---As you have most wisely covered the needs of the Belgian population until the 15/31 August next, we must now, above all, consider the question of the next crop. In order to explain clearly my views, I wish to review the guarantees granted by the German authorities and which have led England to allow the importation of goods to Belgium. The first of these guarantees results from a letter of Baron von der Goltz on the 16th October 1914(244) . . . .
On January last, as the outcome of your endeavors in Berlin and of our negotiations in Brussels, we were able to obtain an additional guarantee. By an order dated 21st January(245) . . . . This statement shows quite clearly that the next crop is unprotected. Should the German authorities seize all or a part of this, we could only base our protest upon the Treaty of The Hague and the international agreements, but the German Government would not be open to any reproach for breach of agreement. On the other side, seizure of the new crop would in no case furnish the British Government with a pretext to stop the flow of goods to Belgium, as their consent has been given on the basis of Baron von der Goltz' letter of 16th October, which Mr. Gibson, Baron Lambert, and myself communicated to Mr. Asquith. It seems therefore beyond doubt that if necessary---I mean in case of seizure of the next harvest---we are at liberty to keep on provisioning Belgium. I think the Belgians of the Comité National should recognize that we are putting up a fight to preserve their harvest for them, and not object to our action in the matter. There is, it is true, no "bluff" about our action, as we are in deadly earnest about stopping the whole arrangement if the necessary guarantee is not given, but the whole value of our attitude as a means of putting pressure on the Germans will be compromised if the Comité National regard us as hard-hearted tyrants instead of backing our attitude up with what influence they have in Belgium. I should be glad if you would communicate the following to our friends in Brussels, also the enclosed copy of letter from the Foreign Office. From discussions I have had with the Foreign Office people .... There is no doubt in my mind that they are fairly in earnest as regards their notice that we must bring our work to an end by the middle of August unless some undertaking is secured with regard to the next harvest. I had intended to come to Belgium long before this to have a general discussion upon the whole situation, but the events arising out of the "Lusitania" incident have made this undesirable until some settlement has been reached in that matter On two successive occasions where vital matters have been at stake, an entire change has been obtained by me through intervention in Berlin.
. . . I assume that this course will have to be pursued again, if the stream of foodstuffs is to be kept flowing. . . . . Many thanks for your letter of the 27th about the harvest. I quite recognize the difficulties you have been under as regards pushing the question at Brussels under present circumstances, but I do not think that it would be of any use to wait longer before taking the matter up officially with the United States Government. The matter is too serious to be any longer delayed---but an official communication to the United States Government should assist you in getting a favourable reply. Suggest you inform your Imperial Bank friend that we have been given absolute orders by Allied Governments to provide no food supplies for Belgium beyond August 15th unless Germans positively undertake that there be no requisitioning next harvest within Occupation Zone. I am confident there will be no retreat from this position and the whole work of Commission comes to an early end unless Germans continue the undertaking which they gave last December in such manner as to cover this harvest. We have done all we could and it is up to them to say whether they desire the activities of this organization to continue. Having brought from different quarters considerable pressure on the Germans to agree not to requisition the Belgian harvest, Hoover went to Brussels to take the matter up personally with the German authorities. As a last resort he was prepared to go on to Berlin to appeal to the Imperial Government. But this was not necessary, for on his arrival in Brussels he discovered that the Germans were in a more conciliatory mood. The Governor-General, he learned, was ready to accept the principle that the Belgian harvest should be utilized exclusively for the Belgian people. This was a victory of the greatest importance, for it not only saved the local harvest for Belgians, but it also saved the relief enterprise from disaster. It remained for Hoover to work out with the Germans and the British a formula for applying the principle that would be acceptable to both parties. (246) The following documents show the steps by which this formula was evolved and the decrees of the Governor-General putting the principle into effect. The Comité National and the Commission for Relief in Belgium, under the patronage of the Ministers of Spain and the United States, and the Chargé d'Affaires of the Netherlands, will continue to import, till the harvest of 1916, the necessary materials for the feeding of the civil population in the occupied territory, placed under the rule of the Governor-General in Belgium. The Governor-General in Belgium will, on his side, leave at the disposal of the Belgian civil population placed under his orders, the produce of the harvest of wheat of 1915, relating to the materials for bread-making (wheat, barley). As soon as the Governor-General has decided on the subject of the division of the harvest, whether it should be distributed over the whole country, or only in the agricultural districts, or else following some entirely different plan, the decision come to is to be communicated to the Ministers of Spain and the United States of America and the Chargé d'Affaires of the Netherlands for transmission to the Comité National and the Commission for Relief in Belgium so that they may make their plans accordingly. I. The C.R.B. has been for some time under negotiation with German shipping companies and with the German and Dutch Governments with a view to the employment of interned German cargo ships(247) to handle the entire relief foodstuffs. This negotiation is practically consummated to the point of signing the agreement. Aside from giving employment to German ships on remunerative rates, the saving to the Commission and thus to the people of Belgium will amount to about £150,000 per month or £5,000 per diem. The only thing which prevents our completing this contract and thus employing these ships instead of others, is the negotiation for the harvest; and every day's delay costs the people of Belgium £5,000. II. It has been with a great deal of difficulty that the English Government could be prevented from issuing a note through the press exposing their paternal interest in the people of Belgium and the desire to secure to them the harvest, and that the Commission is ordered to cease shipments into Belgium until such a settlement can be arrived at. It has been the feeling of the Commission that such an exhibition on the part of the English Government would greatly embarrass all negotiations, and their keen desire that the German Government should be the first to announce this arrangement. Since I came to Belgium we have had two indications from London of the extreme restiveness of the English Government, and it is with difficulty that they are being held back from what they consider would be an action advantageous to their prestige; and it would be most disagreeable to us, now that the German Government has agreed on principle, that it should appear that this had been done under pressure from the English Government as would be the case if any such public announcement were made now by that Government. III. It is perfectly immaterial to the C.R.B. whether or not these negotiations reach a successful consummation, except as to their interest in the people of Belgium. The Commission is glad to serve the Belgian people and the German Government by giving free service of its members to this important humanitarian work. But, if it is not the wish of the German Government to facilitate this matter, or that the Commission should continue on personal grounds, it would be only too glad to retire from the entire situation, which will involve Northern France as well as Belgium. I have just had the pleasure of an interview with His Excellency Baron von der Lancken, and he has handed me the enclosed memorandum from His Excellency, Baron von Bissing, Governor-General in Belgium, in which His Excellency sets forth his willingness to hold at the disposal of the civil population of Belgium the new crop that will be gathered this summer. The formal exchange of letters on this subject will take place within a few days, when certain details shall have been arranged with the Comité National. I am very glad, as I am sure you will be, at this happy outcome of our efforts, and I feel more than ever convinced that it is a very good understanding on all sides and that things will now go on in a very agreeable manner. The Governor-General in Belgium will hold at the disposal of the Belgian civil population of the territory placed under his orders the product of the grain harvest of 1915 used for the making of bread (wheat and rye). On its side, the Comité National and the Commission for Relief in Belgium under the patronage of the Ministers of Spain, the United States of America, and the Netherlands, will continue to import into Belgium, in about equal monthly quantities, until the harvest of 1916, the necessary commodities for the feeding of the civil population within the occupied territory placed under the orders of the Governor-General. Immediately the Governor-General shall have taken a decision with regard to the distribution of the harvest of grain above mentioned for 1915, this decision will be brought to the knowledge of the protecting ministers. In the matter of our conversation of yesterday, regarding General von Bissing's undertaking as to the harvest, I understand that this will be communicated to you formally by the American Ambassador, with the request for an undertaking from you that this Commission will not be interfered with during the next year, in its effort to provision the people of Belgium. Such an undertaking is obviously necessary to us before we can agree with the Germans to continue imports. "a) That the purchase and distribution of the harvest in Belgium shall be under the management of the Commission for Relief in Belgium and the Comité National, in the same manner as the imported foodstuffs, and that the Commission for Relief in Belgium and the Comité National shall continue to administer relief in kind to the destitute, as heretofore, and any regulations entered into or imposed upon the Commission and the Comité National, with regard to their activities, shall be submitted for the approval of His Majesty's Government. "b) With regard to other foodstuffs, not mentioned in General von Bissing's undertaking, no foodstuffs shall be imported into Belgium in substitution for or in replacement of foodstuffs requisitioned from the civil population by the military authorities. "c) Attacks upon the ships engaged upon the work of the Commission for Relief in Belgium shall cease." I was happy to learn from the letter that Your Excellency was good enough to send me under date of the 3d July last that Your Excellency, as well as His Excellency the Minister of His Majesty the King of Spain and the Chargé d'Affaires of the Netherlands are in accord with the memorandum which, on my orders, Baron von der Lancken had the honor of transmitting to them on the subject of the different arrangements to be arrived at for the Comité National de Secours et d'Alimentation of Belgium in view of the next harvest and the continuation of the revictualment. "The Governor General in Belgium will hold at the disposal of the Belgian civil population of the territory placed under his orders the product of the grain harvest of 1915, used for the manufacture of bread (wheat and rye). On its side, the Comité National and the Commission for Relief in Belgium under the patronage of the Ministers of Spain, the United States of America, and the Netherlands, will continue to import into Belgium, in about equal monthly quantities until the harvest of 1916, the products necessary for the feeding of the civil population in the territory occupied under the orders of the Governor-General in Belgium. "As soon as the Governor-General has taken a decision on the subject of the distribution of the 1915 harvest of grain above mentioned, this decision will be brought to the knowledge of the protecting ministers." After having received Your Excellency's letter I again confirm with satisfaction that the revictualing organization placed under the patronage of the worthy representatives of the three neutral powers, will continue until the harvest of 1916, under the auspices of their governments to assure the alimentation of the Belgian population. The Commission for Relief in Belgium and the Comité National de Secours et d'Alimentation have been in communication with General von Bissing with a view to obtain from the German authorities in Belgium an undertaking that they will respect the Belgian harvest and will leave that harvest for distribution to the civil population free from all requisitions, seizures, or interference whatsoever on the part of the German civil or military authorities. I now understand that-General von Bissing has consented to give the necessary undertaking as regards the wheat and rye harvest in the territory placed under his jurisdiction, and the Relief Commission has communicated to me the enclosed memorandum to that effect given by General von Bissing to the United States Minister at Brussels. It would seem, however, that this undertaking is made subject to an assurance on the part of the Commission that it will continue to import regular amounts of foodstuffs into the territory under General von Bissing's jurisdiction in each month until the harvest of 1916, the distribution of the native harvest being conducted pari passu with the distribution of such imported foodstuffs. In order that it may be able to fulfil this condition, the Commission asks for an assurance from His Majesty's Government that they will maintain in force the arrangement by which, since last October, permits have from time to time been granted to the Commission, allowing it to import foodstuffs into Belgium, under the guarantee that these foodstuffs shall reach the civil population only. His Majesty's Government are prepared to give this assurance, but they must give it subject to certain conditions, necessitated by the experience of the last eight months. In order to make the grounds of these conditions clear, I venture to draw attention to the history of the Commission's work. Under the guarantees agreed to by the Commission, His Majesty's Government originally consented to permit the importation of foodstuffs by it at a time when the approaching scarcity in Belgium could be clearly foreseen, and they did so in the belief that the German Government would at last act with forebearance in face of that scarcity. But, in place of forbearance, the German authorities continued to requisition the native stocks of foodstuffs of all kinds in Belgium until the middle of January, and they not only seized such stocks for the use of the occupying army but exported them to Germany. The extent of the subsequent scarcity was therefore deliberately increased by the German Government and in November His Majesty's Government was obliged to call the attention of the Commission to these requisitions and to warn them that the continuation of such seizures must affect continued imports. When in the middle of January the German authorities consented to give an undertaking to cease such requisitions and seizures as regards a limited number of articles of food, they continued their unlimited requisitions and seizures of all articles not included in the small list covered by that undertaking, and they now refuse to respect the native produce of even the articles included in that list, except upon conditions. His Majesty's Government must therefore maintain that the German authorities have taken advantage of the foresight and the labours of the Commission to deprive the Belgian people of their native resources. The German Government have by this action and by the whole attitude they have assumed, shown their determination to divest themselves of all responsibility for the population whose territory they have occupied, and to leave that population to the exclusive care of their own rightful Government, its Allies, and the neutral world. Taking full account of this attitude His Majesty's Government have been obliged to stipulate and now wish to stipulate even more clearly, that the feeding and maintenance of the civil population of Belgium shall be absolutely divided from the feeding and maintenance of the occupying army, and His Majesty's Government have only sanctioned, and will only sanction, the work of the Commission on the distinct understanding that this division is maintained; that is to say, that the Commission gives a complete guarantee that no foodstuffs for which it is responsible go in any way directly or indirectly to any person connected with the occupying army of the German civil administration, and that the relief distributed by it is not in any way taken advantage of by the army or the administration for their own ends. This rigorous distinction must be maintained, and it follows, as a condition precedent to any assurance such as the Commission now asks for, that the Commission and the Comité National shall obtain and continue at all times to enjoy the freedom of action corresponding to their independent responsibility for the feeding and the maintenance of the civil population. I feel obliged to state these considerations because the German authorities have shown a constant tendency to take action incompatible with this distinction. Particulars have been published in the press throughout the world of the coercive measures adopted by the German authorities at such places as Ghent and Malines, and there are indications that they intend to make such measures part of a general policy of coercion throughout Belgium. 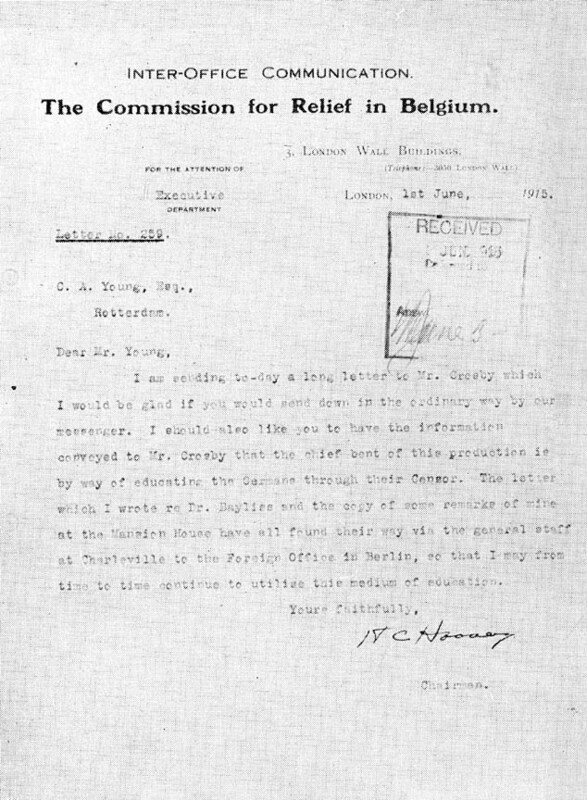 I am not here concerned, and His Majesty's Government are not concerned, with the question whether any particular class of workmen should or should not receive relief, but if the German authorities desire to use the machinery of the Commission and the Comité National for the purpose of coercing the working population of Belgium to employ themselves, against their own will and conscience, directly or indirectly in the service, or for the benefit, of the occupying army, they must themselves provide the relief which those bodies dispense and all arrangements between His Majesty's Government and the Commission must cease. 1. That the purchase and distribution of the harvest in Belgium shall be under the management of the Commission for Relief in Belgium and the Comité National, in the same manner as the imported foodstuffs, and that the Commission for Relief in Belgium and the Comité National shall continue to administer relief in kind to the destitute as heretofore. Any agreement entered into by, and any regulations imposed upon, the Commission or the Comité National with regard to their activities, whether in relation to the harvest or in relation to any other matter, shall be submitted to His Majesty's Government by the Commission for their approval, before the conclusion of such agreement or the acceptance of such regulations. 2. With regard to articles other than wheat and rye, His Majesty's Government cannot of course give any undertaking; and they will not permit the Commission to introduce any such articles into Belgium until an undertaking is given in regard to them by the German authorities similar to that now given in regard to wheat and rye. As, however, the Commission assures His Majesty's Government that six articles of food which it desires to import will in practice not form the object of requisitions in Belgium, His Majesty's Government are prepared on that understanding to allow the Commission from time to time to import these articles, viz---peas, beans, rice, bacon, lard, and maize for human consumption, so long as the import of these articles does not represent a replacement of other articles requisitioned by the Germans. This permission shall be subject to immediate withdrawal upon determination by His Majesty's Government that the import of these articles does in effect constitute such a replacement. 3. As His Majesty's Government have to complain of constant and flagrant violation by the German Government of their undertaking to respect British ships carrying the Commission's foodstuffs to Rotterdam, they must insist that any further attack made on such vessels shall relieve them from all obligations under the present arrangement. Subject to these conditions, I hereby give an assurance to the Commission that His Majesty's Government will continue to give permits for the passage of its imports into the territory in Belgium placed under General von Bissing's jurisdiction. It is of course understood that the present assurances given to the Commission by His Majesty's Government and by the German Government do not supersede, but on the contrary supplement and form an integral part of, the previous assurances and guarantees given by either government. I have decided that all cereals used for. the making of bread, and other agricultural products mentioned in Article I arising from this year's harvest, will be exclusively reserved for the provisioning of the population of the country under the General Government. To this end, I wish first of all that all the undermentioned stocks should be seized, according to the instructions of the present Decree. The intention of this seizure is to prevent speculation in the price of bread; besides, this measure will make it possible to re-distribute in equal proportions the wheat and flour, having regard to the needs of the different regions of the country. I hope that the Belgian population, and especially the agricultural owners, will prove their good will in facilitating the carrying out of this measure, which is for the country's benefit alone. ARTICLE I. All cereals (wheat, rye, oats, etc.) used for breadmaking, and also the barley intended for the consumption of cattle (and for the breweries) growing in the territory under the Governor-General's command, will be seized for the benefit of the country from the moment they are reaped, whether or not they are mixed with other cereals. The seizure includes straw, and flour (with the leavings) arising from the seized harvest. The seizure of straw falls after threshing. ARTICLE II. Unless otherwise noted by this present decree, it is forbidden to exchange or otherwise dispose of by agreement or contract any of the seized harvest. ARTICLE III. The owners of the seized stocks have the right and the obligation to do the work necessary to the preservation of the harvest, and also to proceed with the threshing, etc. ARTICLE IV. If the owner does not carry out within the time fixed by the Chef d'Arrondissement (head of the district) all work necessary to the preservation of the harvest, the Chef will appoint a third person for such work, at the expense of the owner. The same ruling applies to the work of threshing to be done within the time limit set by the Chef d'Arrondissement. a) Anyone taking, in part or wholly, without authorization, the seized stocks, carrying them outside the communal territory; anyone attempting to spoil or destroy, or without authority transferring or consuming them. b) Anyone who, without authority, sells or buys, or contracts for, or makes an agreement about the seized stocks with a view to parting with them or purchasing them. c) Anyone who, contrary to his obligation, does not accomplish the work necessary to the preservation, harvesting, and threshing of the stock within the prescribed time limit. Any infringement of these rulings will be judged by the military courts. ARTICLE VI. The seized stocks will be bought and paid for in cash by a Commission which I shall appoint for that purpose, and the stocks will then be placed at the disposal of the population under the General Government. ARTICLE VII. If it becomes necessary, special steps will be taken to ensure the execution of this decree. "The requisitioned grain shall be bought for cash on delivery by a Harvest Commission which I shall form for this purpose and shall be put at the disposal of the population under the General Government." 1. I assign to the Comité National de Secours et d'Alimentation the sole right to purchase for cash, the requisitioned stocks and whatever bread grains remain, at a uniform price which I will set. The requisitions will not be suspended with this purchase. 2. Subject to my control a Central Harvest Commission will be established in Brussels and in each chief town of the Provinces a Harvest Commission for the Province. 3. The Central Harvest Commission shall be subject to my direct control and its president, members, and their regular substitutes shall be chosen by me. The president will be a delegate of the General Government. a) From the Civil Administration, to be at the same time vice president. b) From the Political Department. c) From the Commission on Banks. d) From the Commissariat of the General Government. e) From the Comité National. f) From the Commission for Relief. In a parity of votes the president shall have the casting vote. The president has the right to summon experts in a consultative capacity to the meetings. The language of the deliberations shall be German. a) The president of the local Civil Administration or his representative to sit as president. b) Two officers or officials, members of the Economic Commission of the Province. c) A member of the Députation Permanente. d) A representative of the grain trade of the Province. e) An agricultural representative of the Province. The members designated under c) to e) shall not at the same time be members of the Comité National de Secours et d'Alimentation. The members of the Commission and their regular substitutes shall be nominated by the Governor of the Province. In a parity of votes the president shall have the casting vote. The president shall have the right to call to the meetings experts in a consultative capacity. The president has the right to oppose decisions of the Commission and to appeal to me for decisions through the mediation of the chief of administration and the Central Harvest Commission. 5. The Central Harvest Commission shall determine what quantities are from time to time to be released from requisition and put at the disposal of the population. It shall supervise the supplying of the Belgian population with bread and is especially to take care that after deducting the stocks to be reserved for sowing, the monthly consumption does not exceed more than one-twelfth part of the entire Belgian bread-grain harvest of 1915. It will furthermore submit to me the suggestions in respect of the uniform ration per capita of population, purchasing price of threshed bread grains, milling, and the maximum prices for the sale of threshed bread grains, flour, bran, and bread. The Central Harvest Commission will supply the Provincial Harvest Commission through the intermediary of the chief of administration with instructions in the case of important questions of policy after having obtained my decision in advance-and supervises their execution. 6. Each Provincial Harvest Commission is responsible for the monthly distribution of the bread grains to the Comité National. The distribution will be based on statistics to be gathered and kept up to date by the Commission. It will supervise the stocks in the Province and those sent in from other Provinces, control the fixed purchase prices and in general all operations of the special office which the Comité National will establish in each Province for the purchase and the distribution of the indigenous harvest. The Commission has power to give instructions to this effect to the Belgian Communes. The rights and obligations of the Députation Permanente according to articles 121, 133, and 147 of the communal law, are, for this purpose, transferred to the president of the Provincial Harvest Commission. 7. Infraction of the regulations and mandates of this decree shall be punishable by imprisonment of not longer than 5 years, or by a fine not exceeding 20,000 Mks. ; the two penalties may be exacted at one time. The German Military Courts are the competent tribunals. Penalties ordained by Article 5, of the Decree of June 30, 1915 (Gesetz- und Verordnungsblatt für die okkupierten Gebiete Belgiens pp. 747-55) remain in force. 8. The present decree does not apply to barley. 9. I reserve the right to make alterations in the present decree. My colleague, the Minister of Spain, and I have communicated to His British Majesty's Government, the memorandum which the Governor-General of Belgium, Baron von Bissing, handed to us under date June 26th, and which covers the discussions which we have had on the subjects of the harvest of 1915 and the provisioning of Belgium. I am happy to learn, and I am pleased to inform you, that the British Government has promised to allow and facilitate the import into Belgium until the harvest of 1916, of the foodstuffs necessary to the provisioning of the civil population of Belgium, under the conditions, the principles of which we have already had the pleasure of agreeing upon with Your Excellency, partly by exchange of correspondence and memoranda, and partly in the course of conferences which we have held with Your Excellency, my colleague, the Minister of Spain, and myself. It will be, I am sure, quite as agreeable for us to come to terms over the details of the execution of these conditions. That the German authorities will at no time employ the Comité National nor the C.R.B. as a means to force the population of working people, against their will and against their conscience, to employment either directly or indirectly benefiting the German Imperial Army. 2. That the purchase and distribution of the harvest of cereals will be made in Belgium by the C.N. in the same way as for the imported foodstuffs, and that the C.N. also with the co-operation of the C.R.B. will continue to distribute help in kind to the needy as before. The British Government has informed us, however, that they will regretfully be compelled to withdraw permission to the boats loaded with provisions for Belgium if, contrary to the intentions declared by Your Excellency, English boats carrying relief goods to Rotterdam are attacked. I am also informed that the British Government will be disposed to facilitate the import into Belgium of other commodities besides wheat, rye, winter barley, and maslin, if your Government will give, on the subject of these articles also, the same guarantee as that given for the cereals. The British Government has, however, declared that it will authorize the import of the following six articles besides the cereals, viz. : peas, beans, rice, bacon, lard, and maize for human consumption, as long as the import of these articles does not represent a replacement of articles requisitioned by the authorities under your orders. It is not necessary to add that if Your Excellency wishes, for any reason, to bring some modifications to the plan suggested above, either in the form of rules or orders, or in some other way, making them as suggestions to the C.N. or the C.R.B., these alterations will at once be communicated to the Government of Britain through the intermediary of the Government which I have the honor to represent. I have no doubt that Your Excellency will be good enough to signify your agreement with the above, and that you will at the same time confirm, in the name of your Government, as the British Government has done, the assurances and guarantees given formerly, and which are included with the stipulations above cited. I take this opportunity to renew to Your Excellency the assurances of my highest consideration. I have had the honor of receiving the letter which Your Excellency was pleased to transmit to me under date of July 16, 1915 concerning the revictualing of Belgium by the Comité National de Secours et d'Alimentation. I was happy to learn that, as a result of the measures which Your Excellency, as well as His Excellency the Minister of the United States had been so kind as to undertake, the British Government has pledged itself to facilitate until the harvest of 1916 the importation into Belgium of the products necessary for the feeding of the Belgian civil population within the conditions upon the principle of which I have already had the pleasure of placing myself in accord with Your Excellency. I have already had the occasion to make known to Your Excellency that the Governor-General has declared himself agreed in principle that the work of revictualing of Belgium continue exactly, for the benefit of the population of that country, under the conditions which were formulated through the agreements entered into between the Governor-General and the representatives of the neutral Powers. That the feeding and support of the Belgian civil population must continue to be separated from the feeding and support of the German Army, and that the decisions made in this sense by the Governor-General in accord with the protecting ministers [MM. les Protecteurs] shall be carried out in all respects. That the Belgian population alone shall derive benefit from the aid which is distributed by the Comité National. That the Comité National and the Commission for Relief in Belgium shall be able to enjoy all liberty of action necessary for them to be in a position to fulfil the mission which has devolved upon them through the agreements entered into between the Governor-General and the representatives of the neutral Powers. That the Governor-General shall never make use of the Comité National to force the Belgian population to employ itself in the service of the German Army contrary to the stipulations of The Hague conventions. That the Comité National shall be the intermediary in the purchase of the harvest of grains in the territory placed under the orders of the Governor-General in Belgium, and that the distribution of these grains shall be done through the care of the said Comité in the same manner as the distributions of the imported goods; that likewise the Comité shall continue to distribute help in kind to the needy under the conditions determined by the previous agreements made between the Governor-General and the protecting ministers. I have taken note of the communication of Your Excellency that the British Government will facilitate, in addition to the importation of grains, the importation likewise of peas, bacon, beans, rice, lard, and maize for human consumption, as long as the importation of these articles does not represent the replacing of other articles requisitioned by order of the Governor-General. I have likewise taken note that Your Excellency will cause to be communicated to the British Government the modifications which might be brought by the Governor-General to the ensemble of the regulations decided upon by the agreements entered into between the Governor-General and the protecting ministers. In conformity with the request which Your Excellency is pleased to make of me in his letter, I have the honor, in the name of the Governor-General, to confirm to Your Excellency the assurances and guarantees previously given and which are specified in the preceding stipulations. I have communicated to the Governor-General the assurance which Your Excellency was pleased to give me, that the work patronized by Your Excellency shall continue to exercise its beneficent action under the conditions of strict neutrality justifying the aid and the protection which the Governor-General and the authorities placed under his orders have not ceased to bring to this institution since its creation. The Governor-General is happy to state that the renewed assurance to this effect which Your Excellency has been pleased to give, constitutes for him a guarantee that the humanitarian purpose of this work can be pursued without injury to the rights which accrue to the occupant of the country, and to the interests of which he has charge. I embrace this opportunity to renew to Your Excellency the assurances of my deep consideration. The Foreign Office communication of the 7th July(249) and von der Lancken's undertakings of the 29th July(250) which assured the continuance of Allied finance and the protection of the harvest in the Occupation Zone provided the basis for the Commission's work during the second winter of the war. The Governor-General's decree dated the 23rd July created the Central Crop Commission to put into effect the arrangements regarding native bread grains which had been agreed upon between the relief organization and the Germans. It is particularly to be noted that this decree provided that the Comité National should have the exclusive right to purchase the new crop and the remainder of any stocks from previous harvests. Though there was some confusion in the early months, by November 1915 the monthly issues of one-fifteenth of the total crop estimated at 202,000 tons became available. Thus the Commission, in making its program of necessary imports, could count each month upon 13,450 tons of native wheat out of the 1915 harvest. Important as this contribution was, the Commission had to import four times this amount, i.e., 54,000 tons each month, to maintain the bread ration in Belgium. By a similar decree dated the 20th July the Governor-General had created a Barley Commission to control the small but important crop of this grain. The Commission included representatives of the Belgian Brewers' Federation and Yeast Manufacturers, but was without Comité National representation. The decrees relating to the establishment of the Central Crop Commission and the Barley Commission are especially interesting because they mark the beginning of a policy which the Germans later greatly extended in dealing with many other articles of Belgian production. They were the first examples of the "centrales" which the Germans created to centralize and control existing stocks of any article when a shortage threatened. Thus there came to be in Belgium an oil centrale, a butter centrale, a sugar centrale, a potato centrale, a vegetable centrale, and a chicory centrale. Except for a few of the centrales, this system of control was not a success in Belgium. The Central Crop Commission controlling bread grains was the conspicuous success and this may be attributed largely to the fact that the relief organization and the Belgians themselves played such a large part in its administration. Other centrales managed exclusively by the Germans appear to have done considerably more harm than good. The potato centrale, for example, dissipated and exhausted the 1916 crop months before the new crop was in. The main trouble, of course, was that the centrale system, where it was without Belgian representation, was a system imposed by a military government on a people whose spirit was unconquered. On an entirely different basis from the decree relating to bread grains were the two issued about the same time covering the extremely important question of fodder. Wheat, rye, and barley were reserved for the use of the civil population, but oats and hay were requisitioned for the benefit of the German Army, though in each case the producers were allowed to retain limited quantities for the upkeep of the animal stock. It is obvious that since the maintenance of meat, fat, and milk supplies depended on fodder, the fodder question was closely related to that of local food supplies. As has already been stated, Belgium was normally a large importer of fodder materials, and the announced policy of the Germans in reference to native supplies soon raised a new issue in the work of the Commission. ARTICLE 1. The oat harvest for 1915 in the domain of the Government General is seized for the administration of the army, at its removal from the soil. This seizure applies equally to the stalk. After threshing the straw is free from all seizure. Every holder of an agricultural estate, and every buyer of growing oats, is obliged to see that the harvest is properly gathered in. 1. The oats seized cannot undergo any modification. 2. No disposition can be made in favor of a third person, by agreement or contract. Purchase, sale, hypothecation, donations, loans. ARTICLE 3. Every owner of an agricultural holding in the domain of the Government General in Belgium having produced oats during the year 1915 or every other proprietor of oats of the 1915 harvest, must take all the necessary steps for the conservation of the stocks seized, including threshing and treating the oats with all the care of a good farmer. a) To sell to the administration of the army on demand, all oats, except seed and forage designated in 6a and 6b; to cart it, to deliver it, and to unload it in its due time. b) To accord to the delegates of the administration of the army free access to all places on his property in order to be able to execute their duty, to submit to them business books, if they possess any, and to furnish them with all details and directions as to where the oats harvested on his property are stored. b) Transport oats without safe-conduct of the administration of the army, with the exception of the movements from the field to the barn, from the barn to the thresher, and from the latter back to the barn. ARTICLE 5. Should any proprietor or owner of holdings omit to perform the acts required by Article 3, paragraphs I and II, within a period fixed by the administration of the army, the latter will have them performed by third parties at the expense of the owner or proprietor. a) At the time of sowing, for each hectare of the surface cultivated by him during the year 1915, 170 kilos of seed oats of first quality and harvested by the owner in question. b) At the time of the need of forage, for each day and each horse in the possession of the owner, 2,500 grams of oats, or in round figures 920 kilos of oats for each horse for each year. By "year" is understood the period from September 1st, 1915, to August 31st, 1916. For each horse which is not the property of an agricultural owner of holdings producing oats, the administration will allow from seizure an annual quantity of 920 kilos of oats in round figures, to be purchased from the producers. On the demand of the chief of district, the rates indicated above can be augmented by the administration of the army for urgent cases and for the horses employed in mines, which shall have first consideration. ARTICLE 7. The administration of the army fixes a price of Frs. 33 for each 100 kilos of good quality oats, at current prices taken by the administration and brought to it in good time at the place indicated by it and weighing at least 44 kilos per hectolitre. The administration of the army will fix the price of oats of minor quality on the basis of advices which will be furnished by experts. ARTICLE 8. Whoever contravenes Article 1, paragraph 2, and Articles 2, 3, and 4 of the present decree will be punished with imprisonment up to five years or with a fine up to Frs. 20,000. The two punishments can be inflicted simultaneously. At this same time, a contravention in the cases noted in Articles 2, 3a, or 4b may occasion a withdrawal of the allowance of oats, in favor of the administration of the army. ARTICLE 9. The judgments are to be delivered by the German Military Courts. ARTICLE 10. The execution of these judgments, and the method of execution is reserved to the Military Administration. ARTICLE 1. The entire crop of grass and clover hay of the 1915 harvest, first crop as well as second crop, is requisitioned for the army administration from the moment it is cut. Any farmer or other owner of a hay crop, whether grass hay or clover hay, is bound to see that the harvesting of the hay is properly carried out. ARTICLE 2. As far as it is not otherwise decreed below, no hay may be disposed of in favor of a third person either by contract or sale. Under the above head come purchase, sale, mortgage, donation, or loan. b) Accord to the representative of the army administration entrance to all parts of his estate for the execution of his duty, present for his examination all business books, and otherwise give him details of such hay crop as is grown on his premises. ARTICLE 4. All farmers or other owners of the hay crop of 1915 are forbidden to transport or move the hay without a special safe-conduct from the administration, except as from the fields to the barns. ARTICLE 5. Should any farmer or other owner of a hay crop of 1915 not carry out such orders as are given in Article 1, paragraph 2. and Article 3, paragraphs 1 and 2a, within the prescribed time, the army administration will have the work done by a third party at the cost of the owner. ARTICLE 6. Such hay as the farmer requires for the feeding of his own cattle shall be free from requisition. ARTICLE 7. The administration will purchase at the maximum price fixed for individual provinces in which the hay is delivered, such hay as is delivered in good quality and within the prescribed time at a place fixed by the administration. ARTICLE 8. Any infraction of the rules laid down in Article 1, paragraph 2, Articles 2, 3, or 4 of this decree, will be punished by imprisonment not longer than five years, or a fine up to 20,000 francs. Both punishments may be ordered together. At the same time an infringement of Articles 2, 3a, or 4 can be punished by a withdrawal of the hay allowed to the proprietor in favor of the administration. ARTICLE 9. Judgment for these punishments is made by the German military courts. ARTICLE 10. The execution of measures of punishment is reserved. These two German decrees regarding fodder were not altogether satisfactory to the British Foreign Office, and when the Commission began to work out its program of imports for the coming winter it encountered new British restrictions. Heretofore the Commission had been practically free to import supplies in such quantities and of such character as the situation required or finances would allow. Hereafter, however, the Foreign Office scrutinized the relief program in detail and authorized only such items as it approved. Some commodities were eliminated, others were permitted in specified quantities. As early as August 1915 Hoover was instructed to cease the importation of maize, which could be used for both food and fodder. This temporary restriction was cancelled, however, on condition that the maize was distributed for human consumption and that none was imported specifically for fodder. Aside from instructions from General von Bissing to the local Kommandaturen that they are to carry out his previous decree in the spirit, i.e., reserve an adequate provision of all the hay crops for the local people, nothing further has been accomplished. The rye crop in the Occupation Zone is of course reserved to the civil population; the oat crop has been largely removed. They do not seem to be anxious for hay, and in fact there is no great amount of it in the country, beyond the requirements of the actual producers, who have the first call on it. My feeling is that the situation is as good as it can be made in this particular; or, to put it the other way, that the Germans have already taken as much material as will be available to them. On the other hand, Belgium never has provided home-grown fodder for her town animals and the amount of maize which we are importing is totally inadequate to keep these animals going. The Belgians are extremely anxious for the right for us to ship in the refuse from the Dutch sugar refineries and linseed cake from the Dutch linseed-oil mills, as these have been standard sources of fodder. I feel very strongly that this should be done at once because under the present stress of shortage of fodder the Belgians are freely selling their cattle to the Germans as they are not able to feed them. As regards fodder, we are now prepared to authorise you to resume importations of maize, linseed cake, and sugar refuse into Belgium. As to amounts, Mr. Hoover's letter states twenty thousand to thirty thousand tons of maize a month as a maximum. The Commission's report dated August 31st states the amount of maize to be imported as twenty thousand tons a month, and this was confirmed by Mr. Crosby's letter, Executive File No. 390, of August 20th, I had taken this amount to be the fixed maximum for the purposes of point 6 of the conditions laid down in Sir E. Grey's letter to Mr. Page of July 17th, and pending further discussion I do not think that this maximum of twenty thousand tons a month should be exceeded. As regards the amount of linseed cake to be imported, this should not exceed ten thousand tons a month for the present, and we shall expect the Commission to fix a maximum for sugar refuse also. The above authorisation is given in consideration of the guarantees given by Mr. Hoover as to the system of distribution adopted by the Section Agricole, and it is understood that the Section Agricole(251) will have control over any fodder imported into the Etappengebiet, equally with that imported into the zone of occupation. The continued authorisation will, however, depend on the Germans refraining from all requisitions or purchases of live stock in both zones, and on no live stock being sold to the German Army or exported to Germany. On receipt of any information that these conditions are not being complied with, or that the Germans are taking advantage of this fodder to pasture their cattle in Belgium, the present, authorisation will be immediately withdrawn. There followed a series of program curtailments by the Foreign Office, which were imposed at one time or another throughout the winter and the spring of 1916. Reports, frequently exaggerated, of German activities, particularly the export of Belgian cattle to Germany, which reached the Foreign Office through its own intelligence service, strengthened the opposition to relief which existed in military circles and brought more restrictions on the C.R.B. On the 16th December 1915(252) the British instructed the Commission to restrict importations drastically and to eliminate entirely the bacon and lard items in its program for Belgium. A new crisis for the Commission came in early January 1916, when the Foreign Office informed Hoover that because of reported leakages of relief supplies into Germany, further restrictions on importations must be made immediately and the whole relief might be stopped. Several questions were involved in this crisis. The Foreign Office insisted that the Commission was solely responsible for the fulfillment of the guarantees by the Germans and doubted the ability of the Commission to discharge this responsibility with the limited number of Americans then permitted in Belgium. (253) The negotiations relating to the reorganization of this distribution and inspection machinery in Belgium to meet British objections are covered by documents in a preceding chapter. (254) In the course of these negotiations the Commission obtained two vastly important results in the spring of 1916: first, an all-inclusive guarantee from the Germans covering all products of Belgian soil(255); and second, a reorganization of the Commission's control of distribution in Belgium through the strengthening of the Department of Inspection and Control. (256) It was not until these arrangements had been completed that the Foreign Office, in the spring of 1916, relaxed the restrictions on importations. (257) The all-inclusive guarantee, mentioned above, extended the principle of protection of Belgian products from requisition to the prohibition of ". . . . the exportation from the territory of the General Government of foodstuffs (including animals), produce, and fodder, serving for human alimentation and animals. . . ." and ". . . . the exportation from said territory of seeds, fertilizers, and agricultural supplies. . . ." The precedent established was never challenged, and in the following years it was merely a matter of working out the details for the control of the harvest in the Occupation Zone. The following documents cover the principal crop decrees of 1916, 1917, and 1918. The following Decrees are hereby annulled: Laws and Decrees S. 671, dated 5/6/1915; do., S. 747, 11/7/1915; do., S. 778, 23/7/1915; and the supplementary regulations of 30/7/1915; do., 10/8/1915 and the notice of the same date; do., 968, of 28/8/1915; the notices of September 10th; the Decrees of September 24th, October 9th, and December 18th, 1915, of January 22d, 1916, February, 29th, and April 1st; the notice of May 31st (page 2248). For punishable offences the old laws remain in force for the offences committed before the publication of this Decree. The same applies to the distribution of the 1915 harvest for personal consumption or for the feeding of cattle. The Decree of May 16th, 1916 ("Official Bulletin," page 2158), concerning the purchase of stocks still remaining, continues in force. ARTICLE 1. Cereals of all kinds (such as rye, wheat, or barley) which can be used in making bread, and to be harvested in the territory of the General Government in 1916, are, by this present Decree, requisitioned for the use of the civil population under the above-mentioned government from the moment that these cereals are reaped, and without considering whether they are or are not mixed with other cereals. The seizure extends also to flour and to the products of the bakeries and confectioneries arising from the seized cereals. The seizure of straw is raised after the threshing, and that of bran is raised after the wheat is milled. The requisition extends also to the cereals and the flour arising from the previous harvests, especially to those quantities which were destined for the personal consumption of the producer or for the feeding of his cattle and which have not been used for these purposes. ARTICLE 2. Except in so far as the present Decree shall decide otherwise, it is forbidden to change the requisitioned stocks or to dispose of any of them by sale or contract or agreement. ARTICLE 3. The holders of the requisitioned stocks have the right and obligation to execute all work necessary to the due preservation of the produce; they have the right and obligation to proceed with the threshing. They are ordered to declare the stocks according to the exact truth. ARTICLE 4. If the holders do not execute, within the time allowed for this purpose by the competent authorities, such work as is necessary for the due preservation of their stocks, these authorities can cause the work in question to be done by a third party at the cost of the holder of the stock. The same applies to all holders who do not proceed to the threshing within the time prescribed by the Provincial Harvest Commission. c) Whoever shall have infringed the obligations which are imposed by Article 3 of this Decree, shall be punished by an imprisonment of not exceeding five years, or a fine which can extend to marks 20,000, besides which, the stocks which were the cause of the violation of obligations can be declared confiscated. The commandants and military tribunals are competent to judge as to infractions under the present Decree. ARTICLE 6. The requisitioned stocks shall be purchased for cash and put at the disposal of the population under the General Government in the form of bread, flour, and bran. The use of the requisitioned quantities of these cereals for other purposes than that of bread-making will be submitted to the consideration of the Central Harvest Commission, which will make a decision for each particular case. ARTICLE 7. The Comité National de Secours et d'Alimentation has the exclusive right to make these purchases of the requisitioned stocks arising from the harvests of 1916, as well as the remains of stocks arising from previous harvests which have not been entirely used up; the purchase will be made at a uniform price which I shall fix in due course. This purchase does not, however, put an end to the requisition. ARTICLE 8. If it is necessary, I shall order that a part of the seized cereals, at most 10,000 tons, shall be distributed to the persons I shall designate to that end, for the purpose of the manufacture of malt to be used as a substitute for coffee. ARTICLE 9. Further regulations may be published with a view to facilitating the execution of this present Decree. Following upon our conversation of yesterday, I send you a note giving a résumé of an order which the Governor-General has sent out to all authorities, both in Brussels and the provinces, to again remind them of existing agreements and to insist on their strict observance. This measure has been taken particularly with regard to the drawbacks to the observance of these agreements presented by the somewhat frequent movements of officers and officials in the provinces. I trust it meets your ideas. At the same time, and in reference to this order, the various central departments interested have repeated to their subordinates in the provinces detailed instructions regarding the application of the various clauses of the agreements and the measures to be taken to avoid the repetition of such contraventions as may be eventually brought to light. I trust that these measures will help to dispel the apprehensions which you may have felt regarding the very firm intention of the Governor-General to have respected by the authorities under his orders the undertakings which he has given. A new order of the Governor-General with regard to the relief work has just been issued to the authorities, both military and civil, of the territory placed under his orders. This order again summarizes the undertakings given by the Governor-General to the Protecting Ministers. In this order the Governor-General again categorically requires that the agreements made should be respected to the letter, and states that he is determined to punish with the greatest severity those who disobey orders relating thereto. He commands that all communications from the Protecting Ministers or from the C.H.N. (258) acting in their name, should be carefully examined into and without loss of time; that the result of inquiries, and---if proof of a contravention shall have been obtained---the punishment inflicted should be immediately brought to the knowledge of the V.C.N. (259) Lastly, the Governor-General commands that suitable measures for the prevention of such acts should be taken in case of need. Furthermore, the Governor-General expects from the authorities under his orders that any action or measure which might be interpreted as a failure on his part to keep his word should be first of all submitted to his decision. I have ordered the minute examination of the special points in question. The examination has been in part carried out and I have instructed the head of my Political Department to inform your Excellencies of the result. On several points, not very numerous, the examination still continues, but I am in a position to state generally ---and I am very pleased to have the opportunity---that from now I shall take care to give my special attention to the strict accomplishment of the engagements which my predecessors have taken with the Ministers of the Neutral States.